"The painter should paint not only what he has in front of him, but also what he sees inside himself. If he sees nothing within, then he should stop painting what is in front of him". A frightening, raging sea crashes in front of the lone, elegant figure. A young man, who stands upon a rocky precipice, is back to the viewer, wrapped in a dark green overcoat, and grips a walking stick in his right hand. His hair is caught in the wind and we may wonder what he gazes at, out there, on a garish landscape covered in a thick sea of fogin. We will never know what he was thinking about. This utterly arresting painting, which Friedrich produced the year he married, could express his own personal struggle to tame his surging emotions for the sake of his young bride. Friedrich, only began painting with oils after the age of thirty. He demonstrates a profound understanding of the medium in the depths of dark color he employs to execute his emotionally wrenching imagery. 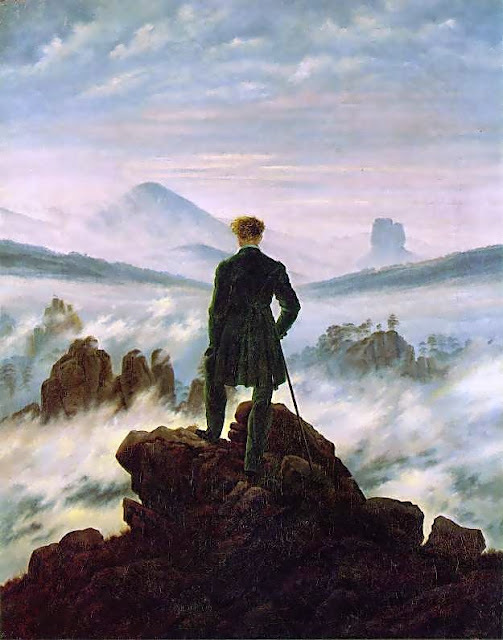 Both Friedrich's life and art are marked with an overwhelming sense of loneliness. This becomes more apparent in his later works, from a time when friends, members of his family and fellow pioneers of early romanticism began to either become distant from him or die. Art historians and some of his contemporaries attribute the melancholy in his art to the losses suffered during his youth to the bleak outlook of his adulthood, while Friedrich's pale and withdrawn appearance helped reinforce the popular notion of the "taciturn man from the North". Events corrupted Friedrich's legacy when Adolf Hitler chose to appropriate one of his paintings Two Men Contemplating the Moon (1830-35) for use as a Nazi propaganda. Despite that anachronistic connection, the mystical, melancholic beauty of his landscapes has endured and thankfully we are here to appreciate them as they deserve.